Delicious served warm with a scoop of ice cream. 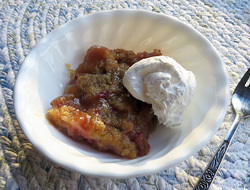 An excellent way to enjoy rhubarb this spring. 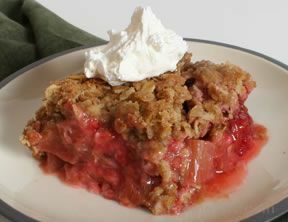 To make filling, put rhubarb, sugar 1/4 C flour and vanilla into a 9x13 baking dish, toss well to combine, set aside. 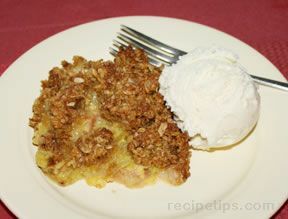 To make crumble topping, put remaining 1 C flour, brown sugar, butter, and salt into a large bowl and toss well. Using fingertips, rub butter into dry ingredients until mixture is crumbly. 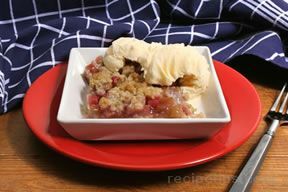 Spread crumble over rhubarb filling in baking dish. Bake until golden and bubbly about 30 minutes. Serve warm with ice cream. "Loved this served warm with a scoop of ice cream. It was good cold with Cool Whip too!"